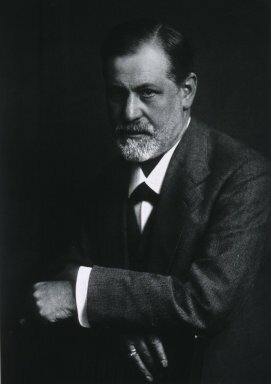 Sigmund Freud (1856–1939), photograph by Max Halberstadt, n.d., from NLM’s Images from the History of Medicine, Image Order Number B012346. Sigmund Freud was born this day in 1856. Just one hundred years ago, a scant six months or so into the Great War, he set down Reflections on War and Death, his thoughts on the meaning of the war that had already spun out so violently—and that had more than three years yet to go. 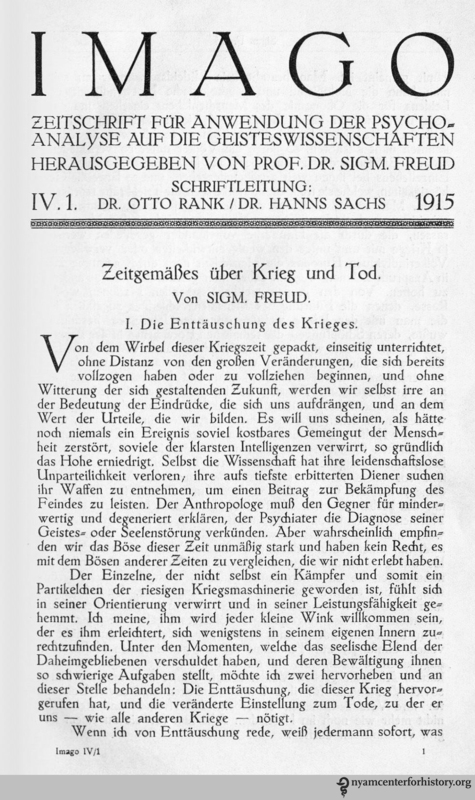 Sigmund Freud, “Zeitgemäßes über Krieg und Tod,” Imago: zeitschrift für anwendung der psychoanalyse auf die geisteswissenchaften 4(1) (1915): 1-21. 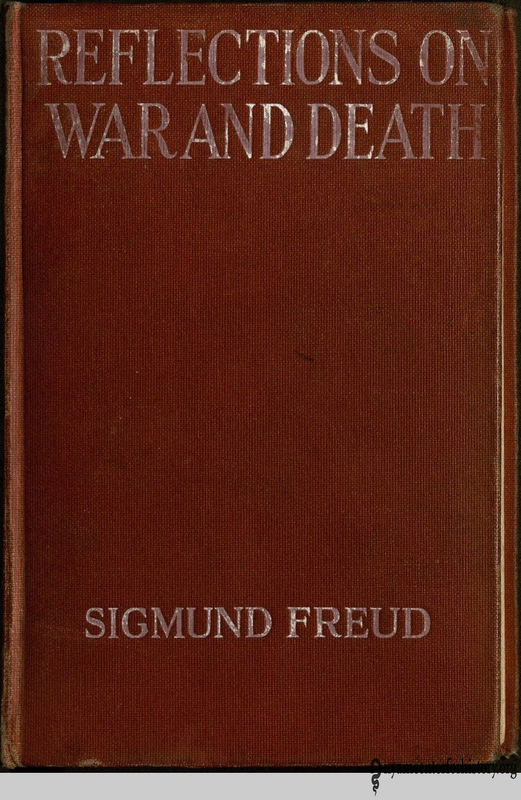 Cover of Freud’s Reflections on War and Death, translated by A. A. Brill and Alfred B. Kuttner, 1918. This book is offered to the American public at the present time in the hope that it may contribute something to the cause of international understanding and good will which has become the hope of the world. This hope was based in a clear-eyed look at the basest human instincts, and the insight that change meant resolution at a deep psychic level, not to be gained by simple moralizing or hand-wringing. The last 100 years have produced a dispiriting number of examples of the failures to which Freud pointed. And the book remains in print to this day. 1. Imago 4(1) (1915): 1-21. 2. Sigmund Freud, Reflections on War and Death, translated by A. A. Brill and Alfred B. Kuttner (New York: Moffat, Yard, and Company, 1918), p. 16. 3. Freud, Reflections on War and Death, 21. 4. Freud, Reflections on War and Death, 29. This entry was posted in Collections, History of medicine and tagged Abraham Arden Brill, Alfred B. Kuttner, Imago: zeitschrift für anwendung der psychoanalyse auf die geisteswissenchaften, morality, psychoanalysis, Reflections on War and Death, Sigmund Freud, World War I by nyamhistorymed. Bookmark the permalink.